I came across several multiflora roses (Rosa multiflora) while walking in a county park last Friday that were being hammered by Rose Rosette Disease (RRD). It was a reminder that this non-native invasive rose serves as a significant source of the rose rosette virus that is responsible for producing Rose Rosette Disease (RRD), as well as the eriophyid mite, Phyllocoptes fructiplilus, that is responsible for spreading the virus. Eriophyids are very tiny mites; you need at least 40x magnification to see them. They are easily spread on the wind and many species practice a peculiar behavior to increase their chances of being blown to new horizons. The cigar-shaped mites have legs that thrust forward from the front of their bodies. They climb to high points on plants and hold on with their legs allowing their bodies to hang-out in the breeze increasing their chances of hitching a ride on the wind. The mite alone causes little damage; however, the virus produces a range of devastating symptoms that first appear in the spring and intensify as the season progresses. Infected plants produce succulent chlorotic or bright red shoots covered in stunted, twisted stems and leaves. The leaves may also appear chlorotic, red, or a combination of both and the shoots may be covered by an abnormally high number of thorns. Heavily infected plants look less like roses and more like multi-tentacled monstrosities. The gnarled and twisted growth may be mistaken for damage caused by a plant growth-regulator herbicide such as 2, 4-D.
RRD was first found in California, Wyoming and Manitoba, Canada, in the 1940s. Early reports described symptoms on both cultivated and wild roses; however, the exact species were not recorded by the diagnosticians causing the earliest hosts to remain unknown and open to debate. In the late 60s, RRD symptoms were observed in California on the wood's rose, Rosa woodsii; a native that grows in the Rocky Mountain uplands and the western plains. However, the impact was deceptive. Symptoms would occur, but RRD did not kill infected plants. This was just the first misleading twist to RRD. It was later observed to cause extensive damage to multiflora rose. This led to the well-meaning but spurious conclusion that RRD could be an effective biocontrol agent in halting the spread of this non-native invasive. In fact, the title of a paper published in 1997 in the journal Weed Science clearly demonstrates the high hopes placed on RRD: Augmentation of rose rosette disease for biocontrol of multiflora rose (Rosa multiflora). A miscalculation in understanding the true nature of RRD is illustrated by this quote taken from that paper's abstract: "Risk to ornamental rose seems to be low under conditions of this study. Plots to assess risk of the disease to ornamental roses, located at distances greater than 100 m from augmentation sites, showed no infection during the 3 yr of this study." Of course, we now know that the RRD virus readily infects ornamental roses including "landscape roses" such as Knockouts. Indeed, the rise of RRD in recent years has seriously reduced the use of roses in landscapes. We also know that even though RRD can cause heavy damage to multiflora rose and it sometimes kills plants, the impact is deceptive. The continual establishment of new plants coupled with vigorous growth allows multiflora rose to outpace the impact of RRD. I've observed this in southwest Ohio where multiflora rose commonly shows RRD symptoms; yet this non-native rose persists. In fact, multiflora rose is an effective sink for the RRD virus and its eriophyid mite vector. 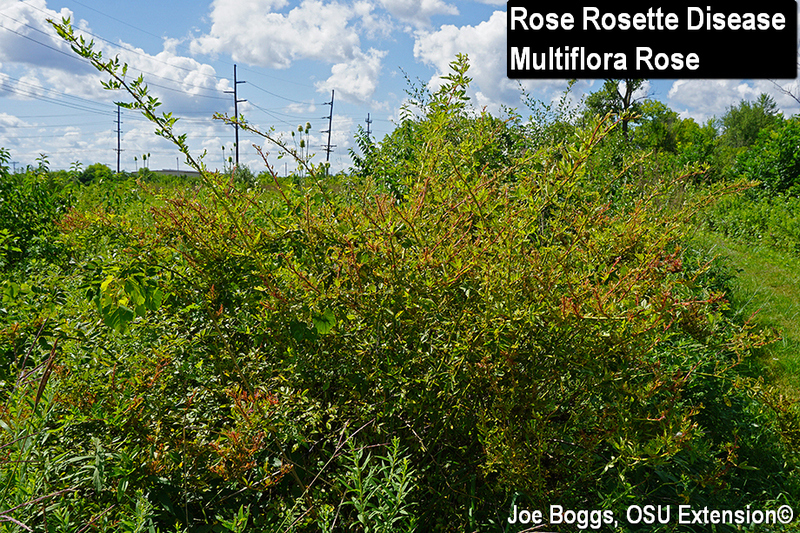 Rather than RRD acting as a biocontrol agent for controlling multiflora rose, it is now widely believed that RRD was spread from the western U.S. and Canada to the east with the aid of multiflora rose. Much has been learned about RRD since it was first documented over 70 years ago. The rose rosette virus is an RNA virus belonging to the genus Emaravirus. The virus is now considered native to North America. It only infects members of Rosa genus; however, the extent of the host range is still being determined. An instructive overview of RRD was published this past May in a special "Workshop" section of the journal HortScience (May 2018; 53 (5)). The lead paper titled, "What is Rose Rosette Disease?" is an open access article and I've included the link below under "More Information." It provides an excellent summary of the research to date on RRD. Remove and destroy infected plants as soon as symptoms are observed. This includes digging and removing the roots. While the virus does not survive in the soil, it will survive for a time in roots. Once plants become infected, they cannot be "cured;" there are no virucides available that will eliminate the virus inside infected plants. In fact, the plants will serve as a source for spreading RRD. If possible and practical, eliminate nearby multiflora rose plants which are the Typhoid Mary's of RRD. Isolate and clean tools and clothing (e.g. gloves, shirts, pants, etc.) used in removing infected plants and multiflora rose. This effort is aimed at reducing the spread of the eriophyid mite. While the rose rosette virus cannot survive long outside of its rose host, the mites carrying the virus can live a long time and hitchhike on anything coming in contact with infested plants. Miticides targeting the eriophyid have produced largely disappointing results. It's more effective to avoid the accidental distribution of mites. We have long appreciated mass plantings of roses; particularly landscape roses. However, canes crossing between plants serve as mite highways and even a light breeze can distribute mites across several plants. Plants should be spaced as far apart as is practical in a landscape design and crossing canes should be removed from established plants. This will affect design aesthetics; however, not as much as the devastation wrought by RRD roaring through a mass planting. Since RRD symptoms lag behind the arrival of mites, it's best to assume plants are infested with mites even if RRD symptoms are not evident. For example, one recommendation for managing black spot of roses is to use a leaf blower to reduce fungal inoculum by blowing infected leaves from plants. Of course, the mites will greatly benefit from this fungal disease management effort; they rely on wind to move from plant-to-plant. Black spot may be a problem, but what's a little fungal disease compared to RRD? 2018: What is Rose Rosette Disease?